By designer demand (aka, Associated Talents!) this gorgeous blue-green metallic thread color is debuting at Kreinik. Meet 096 Sea Glass, and we are making it 'round the clock right now. We are making it in Fine #8 Braid first, which will be followed by production in your other favorite Kreinik metallic thread sizes: Tapestry #12 Braid, Very Fine #4 Braid, Medium #16 Braid, and 1/16" Ribbon. Give us a few months for full production, as we actually do make our own threads, but look for the new colors in needlework stores starting now. Retailers who attended the Destination Dallas trade show were first on the list. 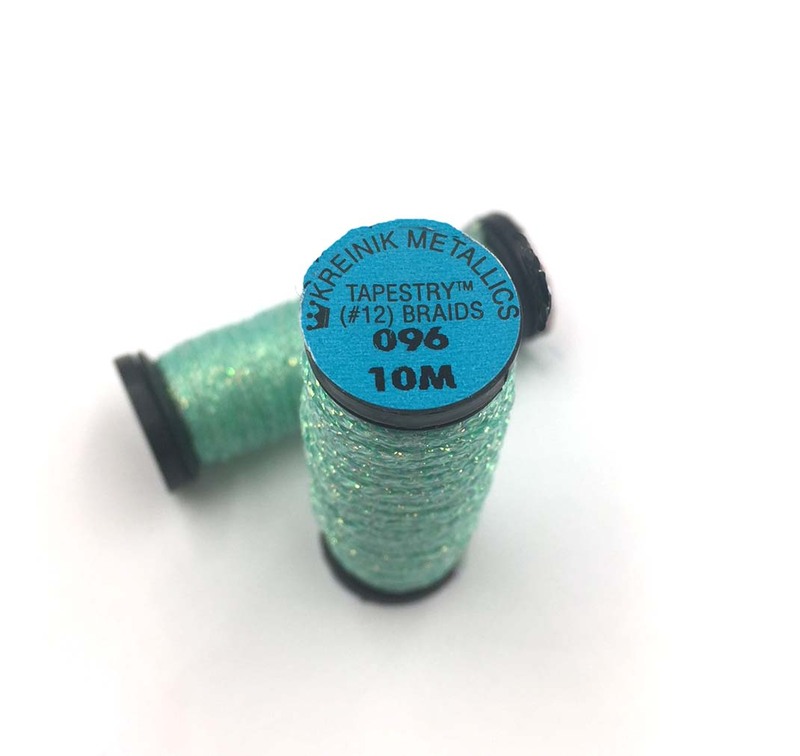 Help us spread the word now to other retailers and stitchers that there's a gorgeous new metallic color from Kreinik. Speaking of Destination Dallas, the wholesale needlepoint trade show held in September of every year: we held the new color next to painted canvas designs and found it matches perfectly to something in just about every design line. Don at Associated Talents knew what we all needed when he suggested this color. Now we wonder how we ever lived this long without it! A big thank-you to Needlepoint In Paradise in Florida who came up with the winning name. 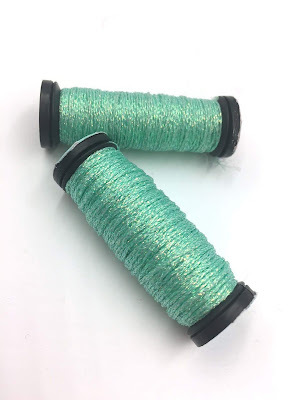 Welcome Kreinik color 096 Sea Glass to your needlework fiber stash.